What do you do with a block of cream cheese, a cup of plain yogurt and a bottle of Ribena in your fridge? I happened to pick up a free Ribena recipe booklet at the supermarket many months ago. I was really amazed by the list of yummy treats that can be made with Ribena. All along I have only enjoyed it as a cold refreshing drink and the furtherest I did was to make them into ice lollies. You can actually use this blackcurrant cordial to make smoothies, slurpees, puddings, and even a purple version of the bandung drink! I've also been keeping a Ribena recipe card which came with a local magazine. Besides this marble cheesecake recipe, you can also make pancakes with Ribena apple sauce and layered Ribena with chocolate mousse. It's not the first time I have made a no-bake cheesecake, but it is definitely my first attempt at making a marble cake or any sort. I followed the instruction and used a knife to swirl over the 'dual-tone' blobs of cheese mixture. It made me really happy to discover that it is actually very simple to make the swirls. I never knew that I would be able to create such a lovely marbling effect. I was so glad with the result that I decided to skip the mirror-layer which is meant to top off the cake. I would consider this a rather light cheesecake since plain yogurt is used in place of thickened cream which is usually called for in a chilled cake. I could taste the Ribena flavour although its presence is not really strong. I guess the whole cake will taste more 'Ribenay' if I were to made the mirror-layer. Nevertheless, the cheesecake tasted very good. I cut a slice for my elder boy and another to take the above picture. He was eyeing at the slice when I was still not done with my 'photo-shoot'. There is no surprise that, what was supposed to be my share landed in his stomach as well. Filling: Measure water into a bowl and sprinkle in the gelatin (without stirring with a spoon). Set aside to allow the gelatin grains to swell (10 mins) before setting the bowl over a pot of simmering hot water. Stir with a spoon and once the gelatin melts, remove the bowl from the pot and set aside to cool to room temperature. With an electric mixer, beat cream cheese and sugar together until smooth. Add in the gelatin solution and yogurt, beat till the mixture turns smooth. Divide mixture evenly into two bowls (about 1 cup each). Add 75ml of Ribena into one of the bowls and mix well with a spatula. Spoon the two mixtures in alternate blobs into the chilled crust. Level top and swirl with a knife through the mixture to create a marble effect. Refrigerate until set (about 2 hours as stated in the recipe, but I left mine to set over night since I omitted the topping). Topping: Measure water into a bowl and sprinkle in the gelatin. Set aside to allow the gelatin grains to swell (10 mins) before setting the bowl over a pot of simmering hot water. Stir with a spoon and once the gelatin melts, remove bowl from the pot and stir in 80ml of Ribena. Set aside to cool. When completely cooled, pour mixture over the cheesecake and chill for several hours or overnight until set. The Ribena Marble CC is definitely yummy. I'm going to try this weekend! Thanks for sharing, I think I'll be able to manage. So glad to come across your blog, I'll definitely be following you, cos we have the SAME interests! Oh, if I have query/comment on an older blog,do I post there or leave it at your lastest blog? I was looking at your apple muffins, mine are usually flat, not like those big puffy ones sold now commonly, - how do I make mine puff up? I love the marbling, so pretty! This looks so lovely! I usually use chopsticks to swirl. I'll try the knife too. My previous cheesecake replaced half of the cheese with yoghurt. Perhaps I can do without the whipping cream as well. Thanks for sharing the recipe. Sure looks yummy! This is one of the most pretty cheesecakes I have ever seen. Its usually strawberries so this Ribena version is indeed a refreshing change! Hey HHB, I have the same Ribena recipe card too! But I dunno where I've kept it, must go and look for it, haha! Very pretty swirls! I'm always tempted to try no-bake cheesecakes, but I'm never able to do it cos it uses gelatin and my mother can't eat it. Do you know any substitutes for gelatin? OOoo I'll try this and serve for desert to my family this week end. Hi Helen, you can leave your comment on the old post, I'll be able to trace it. Hi Jo Jo, yes, me too, I simply select the large size option. Could it be due to the size of your original photos? Did you resize it before uploading to your blog? I don't. HI SSB, I read that you can actually use agar agar in place of gelatin, see here:(http://www.foodsubs.com/ThickenGelatins.html). I will let you know if I am able to get hold of any chill cake recipes that doesn't require the use of gelatin. I've this recipe as well! Hehe! Keep it well in my folder.. I've tried the ribena apple sauce, its nice and goes well with the pancake recipe provided. In fact, the pancakes taste like those Mac-hotcakes! What a surprise. Ribena cheesecake. My kids go crazy over chilled cakes, and with ribena in the ingredients, I cant imagine. Gorgeous!! I love it! Already copied the recipe. So nice cake would like to try this coming weekend but I not so understand the step 5 and the 75ml Ribena blackcurrant juice cordial.Must I add water on it? Sorry to ask the question. it's so sweet looking. is he taste of ribena prominent enough? Hi Lilian, no, you don't add water to the 75ml of ribena. As for step 5, you need to spoon the two mixture into alternate blobs, one colour beside the other. Do note that the ribena flavoured mixture tend to be 'thinner' in consistency, it tend to spread more than the plain one. Then zig-zag the knife through the mixture to create the swirl. That marbled effect is just too beautiful! I love the colors as well. i think this is so amazing and definitely innoative! Who would have thought of ribena cheesecake?? wow! the marble is gorgeous! hi have a nice day.. looking for wallpapers for your house? or your friends/relative interested, visit my blog! hellooo! id like to know what you meant by 'Spoon the two mixtures in alternate blobs' ? how big are the blobs..? Hi /nes*, I just spoon the two mixtures in blobs (one beside the other) until they have filled up the pan. I think it is about a few big spoonfulls for each blob. Hope this helps. I made this cake over the weekend. I tried out the recipe in your post (without the topping) but even tough I chilled the cheesecake from morning and only sliced it late at night (on the same day), the filling was not very firm. Should I have frozen the cheesecake instead? Hey sorry going to ask you this Q but not related to the cake. but i want to ask you about decorating the cake. i use cream to deco it but the cream will melt. what should i do? or you got any icing reciptie? Hi Liting, No, the cheesecake is not meant to be frozen. I suspect it could be the gelatin. Did you use the correct amount? and did you melt it over a pan of simmering water and not boil it directly? If the gelatin is over heated or boiled, it will loose its strength to set. Hi J, I don't have an icing recipe. I usualy decorate a sponge cake with non-dairy whipping cream. I just whisk the cream till stiff before using. I am not sure what kind of cream you are referring to? and did you whisk it till stiff? lovely! i would love to try this one! thanks for sharing! you did them so beautifully too! I have made this lovely cake for my office today.In 3 minutes the cake was gone.Thanks a lot for the receipe. I just tried making this cake..however, the part without the ribena was rather lumpy, even after adding the cordial, i can still see little lumps inside..
and initally, i tot i could do the marbling effect by alternating in the center(one on top of another), and it comes out horrible becoz its not smooth enough and the top part is like rocky mountains lol...but after reading your comments on the alternate blobs, will surely try again and hopefully it will turn out nice like yours. could it be because my room temperature is too low(abt 12degrees) and the gelatine has already harden? Or did i add too much gelatine powder. And thanks for sharing this great recipe. When using dissolved gelatine, lumps will form when the gelatine solution and the cream cheese mixture are at different temperature. Over here our room temperature is about 28degC, so I just make sure both are at room temperature before I combine them. So even if u added in the Ribena cordial, the lumps will not dissolve as the gelatine has already started to set. Maybe you could try keeping the gelatine solution warm the next time you make this...and make sure it is about the same temperature as the cream cheese mixture before you combine it. If you add in too much gelatine, it will not form lumps (assuming at the right temperature). However, the cheesecake will have a slightly rubbery texture. HHB, only saw this now. I'll try this one day since my kids love ribena. Thanks for sharing the recipe! I hope my marbling effect will be as nice as yours. Hi.. I tried it a few days ago and it was great. Personally I think you should try it with the jelly on top.. The tanginess complement the cheesecake really well but it really did hide the beautiful marbling effect. I have a question.. Mine turned out really thin.. unlike your thick cake. Did you double the amount? I bought the smallest springform tin I could find. Another dumb question.. when u say 18cm round pan.. is that the diameter? Hi lizziebeh, No, I didnt double the amount. I used a 18cm pan...and yes 18cm is the diameter. The original recipe is meant for 20cm. You could have used a bigger pan than mine. Hi,it's first time I write in but an avid follower to your blog.I have made the Ribena Cheesecake with great success.I have followed the topping recipe and replaced with blueberry and blueberry syrup, and it turnout like a chilled blueberry cheesecake and it is very beautiful. Hi, your blog is fantastic - keep the recipes coming! One question about your no-bake cheesecakes: do they taste like the readymade cc you get in supermarkets? I would like to make supermarket style cc but i don't know if baked or no-baked is the way to go! Hi, I have not tried any readymade CC (Cheesecake?) so I can't tell whether they are the same? Baked cheese cake will be richer and denser than no-baked ones. Hi, i've always been an avid reader of your blog! For this ribena cheese cake i've followed exactly your receipe. However, can i check with u for the texture of the cake? Mine was those pudding of texture, is this meant to be the kind? coz i thought it should be "melt-in-your-mouth" kind..could it be the gelatin powder that is creating this problem? This cheesecake is not pudding like...you should be able to slice it like a cake and it still holds it shape. I believe it is the gelain powder...or maybe you did not chill the cake long enough? Oh i'm still able to cut a whole slice & retain its shape though. Its just the texture of the cake that i'm puzzled with. I did the same as you, left d cake in the fridge overnight. Yes, i also strongly believe that its should be the gelatin powder that contribute to the "tanginess" texture. As I have no experience in making cheese cake, just need your enlightenment on hw to achieve those "melt-in-your-mouth" kind of cheesecake? Tks! Hi, ok I think I get what you mean. This is a no-bake cheesecake, as such the texture is different from those baked ones (I think you are referring to those cheesecakes you get from cafe? )...which is richer and will give you the melt-in-the-mouth texture. Since I failed in whipping the cream and has produced a horrible Charlotte cake. I am determined to make something edible to 'save' my reputation. The Ribena Marble CC is just so so yummy and beautiful. Really very glad that you shared your recipe and experience. I made this on plastic takeaway tub, it taste great but a bit sour. Is it supposed to be so? I would like to try to make it on a proper baking pan, may I know what is meant by plastic sheets? Is it those transparent sandwich bag? Hi agapejen, I suspect the sour taste is due to the yogurt you used. Some yogurt (eg Greek style) can be very tangy. As for the plastic sheet, I cut out a strip from a cookie bag, you can cut out from any plastic bags as long as the material is firm enough. Hope you get what I mean. Thanks. So Yoghurt is the culprit!! May I know which brand of yoghurt did you use? The Ribena Marble Cheesecake are my favorite. I love baking them and decorating Kids love them too. these make good edible Christmas decoration as well. thank you for shearing your post. I really like your site and have attempted two dishes. I did a) Cheesy baked rice (Modified it with chicken cutlet though) but it turned out a tad too dry. =( Maybe it's cos i used the can mushroom soup. b) Ribena Cheese Cake and it is setting in my fridge now. Hopefully it turns out as amazing as yours. Hi Caroline, I don't think there will be a problem, as I lined it just for easy unmolding. This looks awesome, really making my mouth water. I can't wait to try. Ribena blackcurrant juice cordial = concentrated Ribena ?? Hi, yes it is concentrated ribena. Hi JF, yes you can beat the cream cheese manually. 1) I jz bought a bottle of Ribena + Glucose. Can i use this for making this cake? Or it has to be just the Ribena original flavour ? 2) I'm not quite understand step 5. can you please explain further? 3) You stated that you omitted the topping, so your cake (as shown in the pictures) just stopped at step 5? 4) If put topping, the results should be jelly-liked topping? hmm.. interesting recipe, really make me wanna try out. I've got almost all the ingredients, except for plain yogurt only. I made this but I don't have much luck with the crust. Too much biscuits and too little butter. Wonder why? Also, I didn't measure out the ribena so my colour contrast is not obvious. Your cake looks more appetising! 1) I have not bought any Ribena with Glucose, if it taste the same as the original flavour, I think you can use it. 2) Step 5: Spoon one blob of coloured mixture (with ribena) onto the crust, then spoon one whte mixture blob beside it, followed by the coloured mixture and so one. Just alternate the mixtures. Then smooth the surface and use a knife (hold vertically) and swirl through the mixtures to create the marble effect. Hope this is clear. 4) Yes, there will be a jelly layer. Hi Blessed Homemaker, I didn't have the problem with the crust. The mixture may appear 'loose', you just need to press it down onto the pan, I used the back of a glass to press it down. Then freeze it for an hour or so, and the crust will be hardened. Hi, Do you think it is ok to use same amount of icing sugar in place of caster sugar? Thanks! Hi, yes you can replace it with icing sugar. Hi HHB, I tried this non-baked cheesecake, and my friends love it! Thank you very much! Just that my cake didn't look as pretty as yours. My marble effect is so-so and the color looks pale. Would love to try this Ribena CC but I dun have a removable base pan, what will happen if I set this no-bake CC on a normal pan? Hi Li, you won't be able to unmold the cake. You can improvise by lining a normal pan with alum foil, leave about 1~2 inches over hanging on the side. To unmold, simply lift up the whole cake and tear off the alum foil. Try to line the sides of the pan as evenly as possible so that the side of the finished cake will not have too much crinkles (because of the foil). Hope you know what I mean. Hi ! I tried your ribena marbled cake for my husbands birthday yesterday anf it turned out just amazing.It was a great hit and everyone just loved the amazing flavour and could not believe that it was flavoured with ribena. Thanks a lot. if i make a cheesecake bt i need to bring it out for more den 3 hrs b4 cuttin e cake. n there is no fridge for me to keep e cake. wat will u recommend me to do. hpe to hear from u soon. thks! Hi Chushy, are u a local? I don't think it is possible to leave a cheesecake for 3 hrs without refrigeration especially under this hot weather. I am sorry I am of no help here. hi,i baked the cake last weekend..the taste was good,but the texture of the cake is very unlike of the bake cheesecake, is it? the base crust of my cake was very soft,and easily crushed. my marble effect wasnt obvious too, should i add more ribena to it? 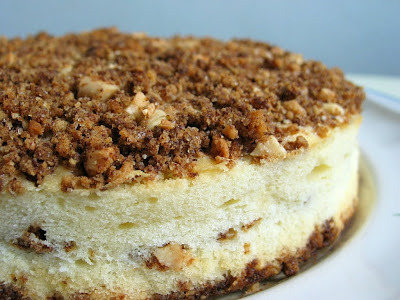 Hi yammy, this is a no bake cheesecake, the texture is different from a baked cheesecake. You need to press the biscuit crumbs firmly to the base, and chill it in the freezer before using. I didnt have problem with the marble effect, but you can try adding more ribena. Hope this helps. Hi, the cake looks great! It is in my to-to list. A question here, do I need to refrigerate the cake for 2 hours before I add the topping,or it can be added right after the cheese mixer is done? Chang, you need to chill the cheese mixture for about 30mins to 1hr. It should be slighter set, before pouring the jelly mixture over. Test by spooning 1 to 2 tablespoon. If the cheese mixture is not set, the jelly solution will become 'cloudy' and you will see tiny bits of cheese mixture starting to dissolve. on the other hand, if the cheese mixture is too well set, the jelly layer may not 'stick' to it. So, upon slicing the finished cake, the jelly layer will separate/slide off from the cheese layer. Hope you get what I mean. Do you think that cheesecake is hard to make? Hi, you need time to chill the cake in the fridge. Maybe you can try making cookies and muffins instead? Thank you. but since i already bought the ingredient i must a well try it first. will the shape of the cake be different if it is not chill and will it also taste different? sorry that i ask so many questions. i find it hard to choose a right recipe. Hi, you need to chill the cake for it to set otherwise you can't unmold it, it will be too watery. ok. Thanks. i am very lucky that i found you blog. thanks again. hi again. i need help. the cheesecake i made is watery. i did chill it. is it because of the gelatine? i put hot water in the gelatine at the last minute. but is it too little? or do you want to see the recipe? Hi, it is likely due to gelatine, you have to follow the recipe closely, all the ingredient amounts and steps have to be followed. I don't think you can turn a baked cheesecake into a no bake one. If it requires baking, you have to bake it. ok. but i want to make a no bake one since i know that there is such thing as no bake cheesecake. Haix..... i should do more research first. so, the bake one require soured cream so if i making a no bake one, should i take away the soured cream and the egg? and do i have to add in natural plain yogurt? how much serving is your Ribena Marble Cheesecake? Hi, sorry I am not able to comment on this. But I think you cannot change a baked cheesecake recipe to a no bake one just by replacing some of the ingredients. As I mentioned in my previous comment, you need to follow the recipe closely. Unlike cooking which you can freely replace the ingredients, baking is Science, there is a reason why certain ingredient is used. This ribena marble cheesecake serves 8. Hi, I don't have any video to show. Just add one scoop of plain, followed by another scoop of 'coloured' mixture...arrange them alternating...ie side by side...one plain, one coloured, one plain, one coloured and so on. Hope u get what I mean. Hi.....instead of Ribena can i make it with melted chocolate....will that be ok coz we dont get Ribena where i live....thanx. Hi Nidhi, I don't think you can replace it with melted chocolate, the consistency will be different, the cheesecake may not set well? Hi hhb! I wonder how does no bake cheesecake taste like? I used to make it and it's like a jelly and yday I made it and after one night of chilling, it's still nit very firm. Should I have freeze it in the freezer and can I do that? Hi Aimei, no, you shouldn't freeze it in the freezer, if not it will turn into ice?? It shouldn't taste like jelly (maybe too much gelatin? )...it should be smooth, soft and firm enough to hold up as a slice...as firm as silken tofu?? yet, it should melt away in your mouth. If the cheesecake didn't set well, then I suspect it could be due to the gelatin? Do not dissolve it over direct heat, otherwise the gelatin will not work well. Hehe yup ok. I typed wrongly. How long can a chilled cheesecake stay at room temperature? Hi, I am not sure what is the amount to replace, also do note that the taste will be affected as it would not be as light and refreshing. Sorry I'm of not much help. Hi,I make this cheesecake few times from your recipe, my family loves it so much especially with the blueberries. Thks for wonderful recipe. Hi! Thanks for ur lovely recipe! My children like it. But the texture seems to be a bit rubbery. Shld it be like this? If I were to increase the portion to 1.5x the recipe, do u think i need to increase the gelatin and the water portion too. Thanks! Hi, it could be due to the gelatin...maybe you can try reducing it. I am sorry I do not know the amount of gelatin to use if you were to increase the portion. Gelatin can be quite tricky, too little, the cake may not set, too much, it will end up rubbery. Hi HHB, I love your blog and I am new in baking. I've tried your banana cake and muffins and cookies last week and they taste wonderful. My girls had a great time helping out too! Really wanna thank you. - first, measure the required amount of water, put it inside a bowl. Sprinkle in the gelatin powder and leave it aside for about 10mins. Do not stir. - Place some water in a pot and bring it to simmering. - Place the bowl (with the gelatin powder) over the pot of simmering water (pot is still heating over the stove). Make sure the bowl is bigger than the pot. - Stir with a spoon once the gelatin melts and remove the bowl from the pot. set aside to cool before using. Hope I am clear with my explanation? Thank you for your explaination, really appreciate it. Can I replace Ribena blackcurrant juice cordial to other cordial? Coz we are not a fan of Ribena and I can't seem to find any smaller bottles of Ribena. All are as big as 2L when I only need 75ml! Hi Bebe, you may experiment with other cordial, but I really do not know whether it will affect the end result. can I use double ur recipe amy to make into a taller cheesecake if I use a 10" baking pan? I am not sure whether you can simply double the portion, mainly because of the right amount of gelatin to use...too little the cake may not set well, a little too much, it will taste a bit 'rubbery'. Do I need to use the parchment paper to line the base only or as well as the side? I'm using springform n removable base pan. Can I just line the base? How to unmold the cheesecake? Need to insert a thin blade into the sides first? Melted butter means must leave butter to room temp? Or I shld remove frm fridge then heat under the fire? Hi, I lined both the sides and the base. If you are using a springform pan, then u don't have to line the sides. Just release the latch of your springform pan to release the cake. Sorry, I don't have a springform pan, I'm not sure whether you need to run a blade along the sides? Melted butter refers to heating butter till it becomes liquid form. hope this helps. thanks.. I'll need this recipe.. I just made the cheesecake... All was well until I poured the liquid gelatine into the cheese yoghurt mixture. It started to form little white bits and the whole mixture turned a little watery. I read from the earlier comments that the gelatine and cheese yoghurt mixture must be in similar temperature before mixing them together. I guess I made this mistake cos when I added in the yoghurt, it was directly from the fridge which would make the cheese yoghurt mixture colder. Am I right to say that the yoghurt needs to be in room temperature too, besides keeping the cheese yoghurt mixture and gelatine at same temperature? Is the final mixture suppose to be watery? Hi Cassie, did you bring the cream cheese to room temperature before beating? if you have done so, I suspect it could be due to the temp of the gelatine solution, not so much the problem of the yoghurt. The gelatine solution should be set aside to cool off (not chilled though) do not add in when it is still hot. The final mixture is not very watery, not thick but still spoonable the consistency is something like yoghurt. Me again :).. I made this cheesecake for the 1st time followed every steps n comments consideration. My no-bake version was a success n my kids love it. I used a disposable round tray as I didn't hv the right pan. Hence, there was lines around the size, though considered 'not smooth' like normal cake, I loved the imperfect look instead. U can take a look at my simple blog "fisoulbaking.blogspot.sg"
I do hv a qtn though - when I added the ribena in Step 4, the mixture became semi-liquid compared to the non-ribena mixture; and it spreaded when I put into the tray. Hence I didn't hv a nice marble look n the cake was almost purple. Hi Fi Fi, when you mix in the ribena, your can try fold in gently with a spatula instead of whisking or stirring. Also add in the ribena gradually. Hope this will help prevent the cheese mixture becomes too thin and runny. I have tried it with agar agar, the traditional long one, it was very good. I think it is due to difference in temperature between the gelatine solution and the yoghurt. Your yoghurt could be too cold while the gelatin too warm. The mixture starts to solidify immediately causing the curds to form. I dont think it is the amount of ribena...you could have placed too many blobs of the ribena mixture (ie too small a scoop while trying to spoon the 2 mixtures)...as a result, it combined with the plain mixture and the swirls were not distinctive. Or, you could have made too many swirls? Great to hear that all went well and happy belated bday to your son! My ribena portion is really liquidy, is that normal? :/ pls help! Hi, did u divide the mixture into 2 equal portions? Was the ribena portion too little before you add in the ribena?